AS CORN WAS BEING REMOVED from the flat grain storage facility at Meadowland Farmers Cooperative last Thursday, firefighters from Tracy and Walnut Grove were called back to the scene of the January 13 fire. The Tracy Fire Department was called back out to Meadowland Farmers Cooperative last week. 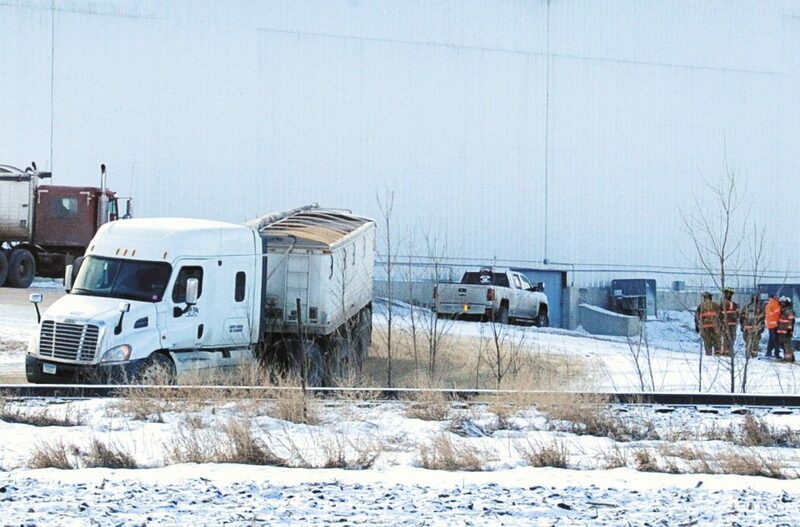 Meadowland General Manager Mike Trosen said the metal transitions where the corn flows from the flat grain storage facility to the conveyor got hot, and the corn got hot over five of the transitions. He said the Walnut Grove and Tracy fire departments sprayed water on the corn to cool it down. As of Monday, about 900,000 bushels of corn had been removed from the building, which had 4 million bushels in it at the time of the original fire. The majority of the corn has been good quality and has been delivered on contract to Highwater Ethanol. Trosen said Highwater has helped us by extending its hours a couple of days to allow Meadowland to get more corn hauled. On Sunday, January 13, eight fire departments from four counties were called to battle a fire that started in a conveyor tunnel underneath the flat grain storage facility at Meadowland, which is located just east of Walnut Grove. The flat grain facility is 500 feet in length, and the tunnel is 600 feet long. It held about 4 million bushels of corn at the time of the fire.